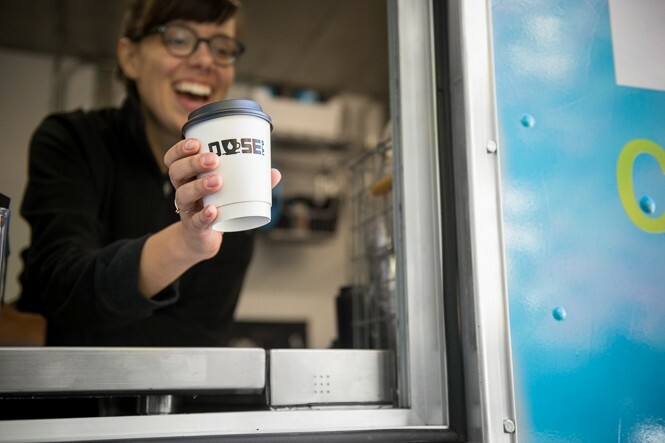 Chatting about the awesome brews from the SLC's-based coffee truck. 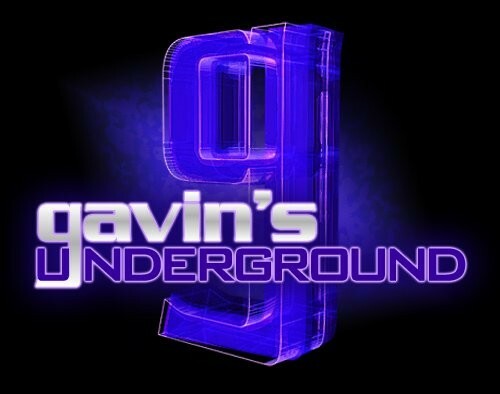 Gavin: Hey Jackie, first thing, tell us a bit about yourself. Jackie: I moved to Salt Lake City in 2001 when my truck broke down here. It was the year of the Olympics, it snowed like crazy, and I decided not to leave. I love the Wasatch for its skiing terrain and snowfall, as well as the single-track and general cycling scene. Though I consider skiing my first love, cycling is definitely where I've made my career up to this point. One thing both sports have in common is a strong culture of caffeination. I've tried to move to California a few times since 2001, and always come back to Salt Lake City. It is home! Prior to Dose SLC, what kind of work had you being doing around Utah? Since originally moving [here] in 2001, I've worked in some sector of the outdoor industry. I was a freelance writer for the ESPN X Games, I was a content editor for Backcountry.com for several years, and I lived in Utah when I began my career with Giant Bicycle. I moved to California to pursue a marketing position with Giant's women's program, Liv, and returned in 2014 to serve as a development officer for Huntsman Cancer Foundation. While in the Huntsman position, I helped to produce and promote fundraising events like the Huntsman 140 and Huntsman 5K, which raised funds for cancer research. I loved the job and the people, but was also confronted with the reality that life is short, and if you have the opportunity to pursue a dream, you should go for it without delay. I made the choice to leave Huntsman and see if I could make Dose SLC a reality. In the meantime, I took a position with Bingham Cyclery last fall, working to reinvigorate their marketing and community outreach programs. In August, running Dose SLC became my only job. Did you have a passion for coffee, or was it more just something you really enjoyed in general? I have had a passion for coffee, and have worked in the coffee industry for supplemental income since I was a freshman at Western State College of Colorado in 1997. I love drinking coffee, but I also love the service side of the industry. It was only within the past three years that I really honed in on the concept of owning my own coffee business. In early 2015, I attended the American Barista and Coffee School in Portland, Ore. to see if I really did want to turn my passion into a career. 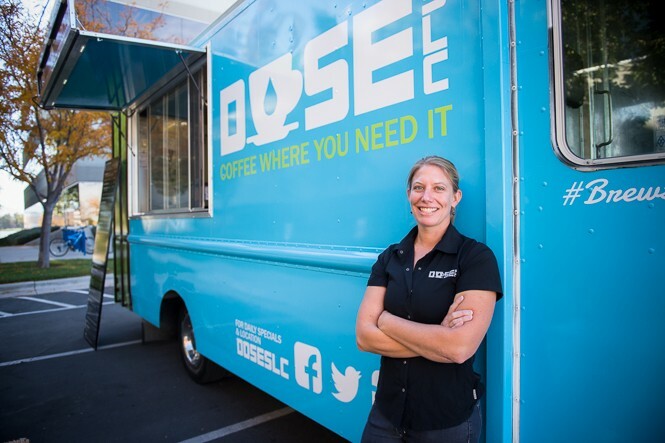 The school was essentially a small business school focused on the specialty coffee industry, and without that experience, I certainly wouldn't have been able to successfully launch Dose SLC. What did you think of the food truck craze that started hitting SLC a few years ago? First, it's genius, because, in reality, SLC has so many communities and many areas where a full-time brick-and-mortar store or restaurant would be very difficult to successfully maintain. Second, SLC tends to follow the trends that other cities like Portland, Austin, Seattle and L.A. have established—it just takes us a few years to implement them. In my position with Giant, I traveled the country helping retailers improve their women's cycling business. As a foodie before "foodie" was a term, part of what I loved about traveling was experiencing local food and coffee. The ability for food trucks to offer unique dining experiences within any environment is something that all cities should embrace. I think that the health of small businesses, local restaurants, specialty coffee shops and food trucks tells the story of how special and unique a city is. SLC has a long way to go as far as fully embracing the culture and the ability for entrepreneurs to easily bring their ideas to life, but it's also made huge strides in a short period of time. 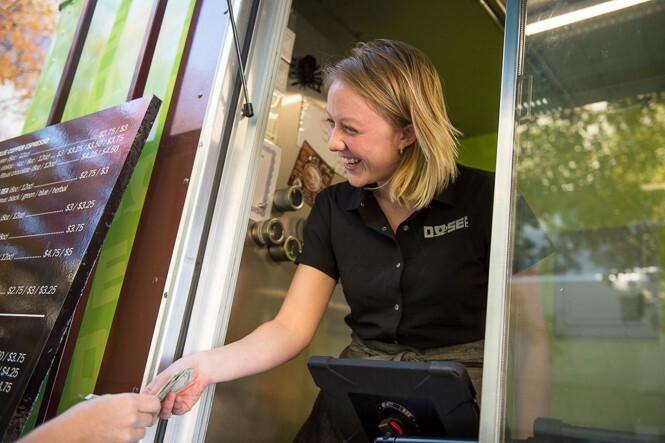 The appearance of food truck courts, co-ops and training programs all bode well for a vibrant future. When did the idea come about to start your own that was coffee-based? I had always thought that I would start a store as a brick-and-mortar location near Big and Little Cottonwood Canyon. However, while at coffee school, it became obvious to me that the location availability, build-out costs and leasing, and year-round customer base would be very limiting to success. I worked at a tiny little drive-through coffee shop in what was an old Kodak photo booth in Marin County, Calif. for several years. The coffee quality was high, customer loyalty was through the roof, and frills were minimal. I loved working there, and the simplicity is what set that store apart from anywhere else I had worked. I realized that I wanted to recreate that, but also be able to move to where the needs are greatest. As a skier and cyclist, these areas include races and events, trailheads and the areas where other skiers and cyclists live and work. Considering SLC's growing affinity for trucks, it seemed like a perfect fit. What kind of research did you do prior to launch? Where did you find the truck? So much research! Coffee school was such a help. I also applied for and received an SBA loan, which required a lot of projections, plans and commitments. I searched for truck builders around the country, and at the hint of some friends, found Utah Food Trucks here in Murray. Utah Food Trucks is run by Don and Jamey Gansen, and it turned out that they are a BMX family. Jamey and his wife are very involved with Rad Canyon BMX, and that gave us quite a few additional connections. When I came to them with my plans for the truck, Jamey jumped on it. Don helped me source the truck, and they built my dream for me! Considering the coffee culture we have in Utah, how did you go about figuring the kind of coffee you would serve? There are a lot of stellar roasters in town now. That is another thing that is exciting about SLC's scene right now—I actually did have to decide which roaster I would pursue. I knew I needed someone who could help me start from small orders to the larger volume my goals require. I also wanted to work with a roaster who would be excited about the truck concept and understand some of the unique features and limitations that serving in various temperatures and locations might pose. Patrick Andrews from Blue Copper was immediately on board. Not only do I love the way he roasts, and the varieties of beans they carry, but I love that I am able to support this smaller-volume roaster who takes such pride in his craft. 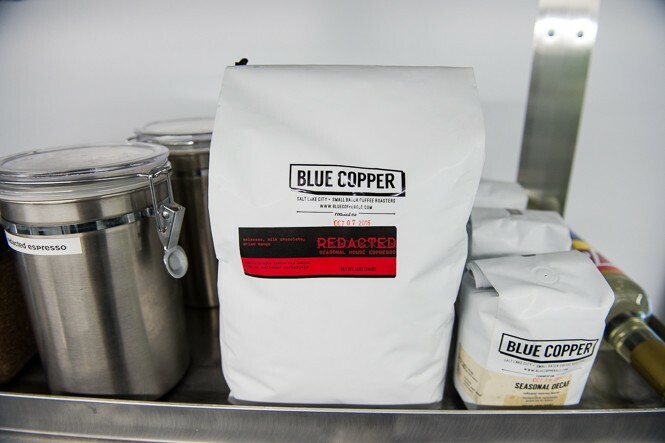 We are currently serving the Blue Copper Redacted espresso, which features a lighter, brighter overall taste than many other espresso roasts, and serves a delicious straight espresso dose or Americano, but also blends beautifully with milk and our Ritual chocolate offering. And that brings up another point: My goal is to sell high-quality products with local ties and positive philosophies that tie into the outdoor industry and our local community. I took as much time figuring out which chocolate to use (Ritual from Park City), tea (The Queens' Tea from SLC), other drinks such as switchel (Up Mountain Switchel—it's an incredible ginger drink, and we are the only Utah vendor), and food items (June Pie from Heber City and PlayHard GiveBack from Ketchum, Idaho). What kind of system do you have in place to make sure you're getting the freshest cup? I order small batches of coffee. I can order twice a week from Blue Copper, so I make sure the beans that are being ground are only about a week out from their roasting date. We don't pour coffee into the grinder until it's needed, and never let beans sit in a hopper overnight. Because we only pull espresso doses from our Nuova Simonelli espresso machine, we never have to worry about drip coffee sitting for too long—one of the many reasons we don't offer drip. 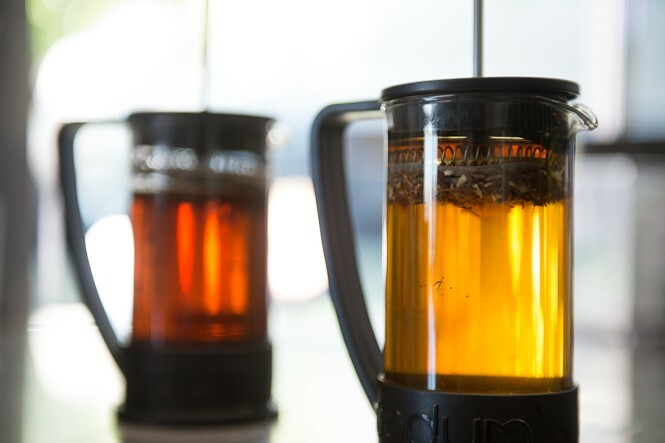 We French press our teas from The Queens' Tea, so that customers are handed a tea that is properly steeped, without a soggy tea bag to dispose of later. How do you go about choosing where to set up every day? I always make arrangements. Currently, we are serving frequently near Backcountry.com and Clearlink, with plans in the works for Sugarmont Plaza, Cottonwood Heights and Murray locations. Our Saturdays are mostly dedicated to events. By making arrangements ahead of time, customers know where to find us, and the brands we are connected with are able to share our schedule with their staff. On that note, if a location isn't producing the numbers I need, I am not hesitant to make a change. Sometimes the novelty brings people out more than a regular schedule. What made you decide to incorporate breakfast food into the menu? Ultimately, my goal is to serve skiers and riders heading up Big or Little Cottonwood Canyons in the winter. What goes better with a delicious espresso drink while you drive up the hill than a fruit-filled June Pie? The bonus is that they are also a yummy mid-afternoon treat or dessert! What's your relationship like with other truck vendors in the city? I'm making those relationships now. Being out on the road is a much easier place to meet other vendors than it was when Dose SLC was still a concept. My experience so far has been that everyone is awesome. We trade food for drinks, check out each other's setups and share intel on good spots. 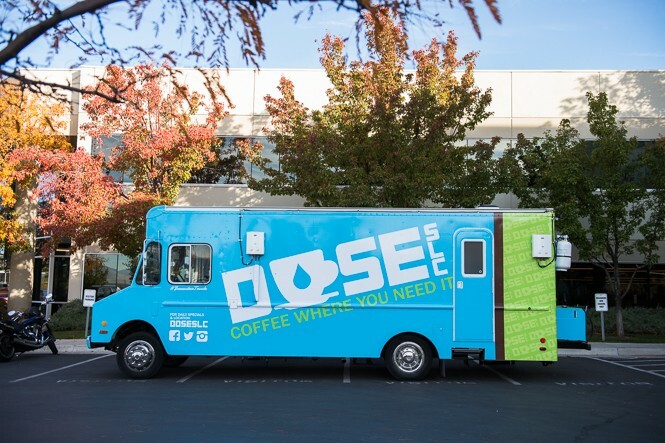 Because there are currently only three major coffee trucks in the valley, I'm not in direct competition with most other trucks. That definitely makes it easier to share experiences. 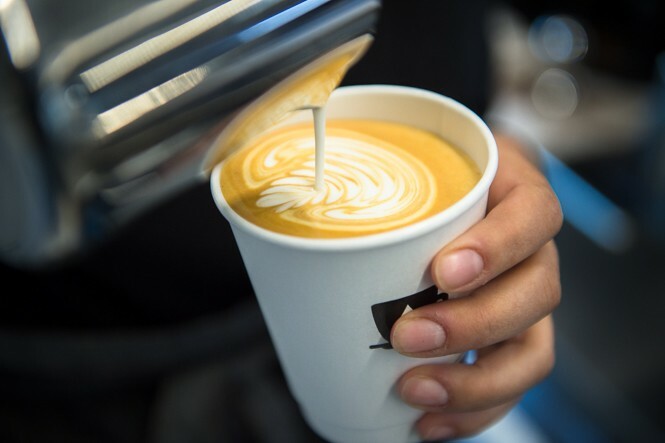 However, there is a great enough need for good coffee in many areas, that I wouldn't be surprised to see a few more coffee, soda and other specialty beverage trucks pop up very soon. How can people find out where to find you or suggest a place? I'm working on a locator app to make it super easy. But for now, I provide direct links on our website for each upcoming week. You can also follow us on Facebook, Instagram, and Twitter to keep up to date. 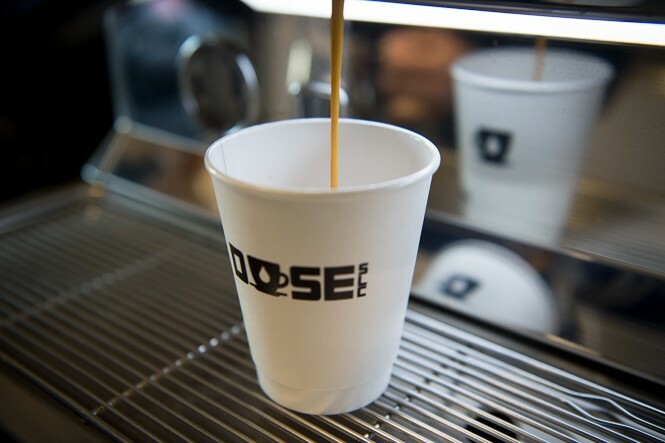 Anyone who'd like to suggest a location or would like to inquire about catering can email me at info@doseslc.com. Do you have any plans to expand or add another truck to the mix? Haha! We are always talking about Truck #2 or #3, but I want to make sure #BrewsterTruck is successful first. I have my eye on some potential retail locations for the future. Also, the concept of franchising has come up before—but I haven't been on the road for a full month yet. I'll ponder those options when I'm overbooked. What can we expect to see from you and the truck going into next year? I am really enjoying promoting our local vendors. I would like to host pop-up shops to showcase these amazing businesses. I'm also looking forward to creating special co-op menu items and hosting public events with local brands you might not directly associate with coffee. In addition, I'm planning some customer clinics and events to help educate enthusiasts about coffee, tea and chocolate in general, in addition to the processes and philosophies our vendors utilize.